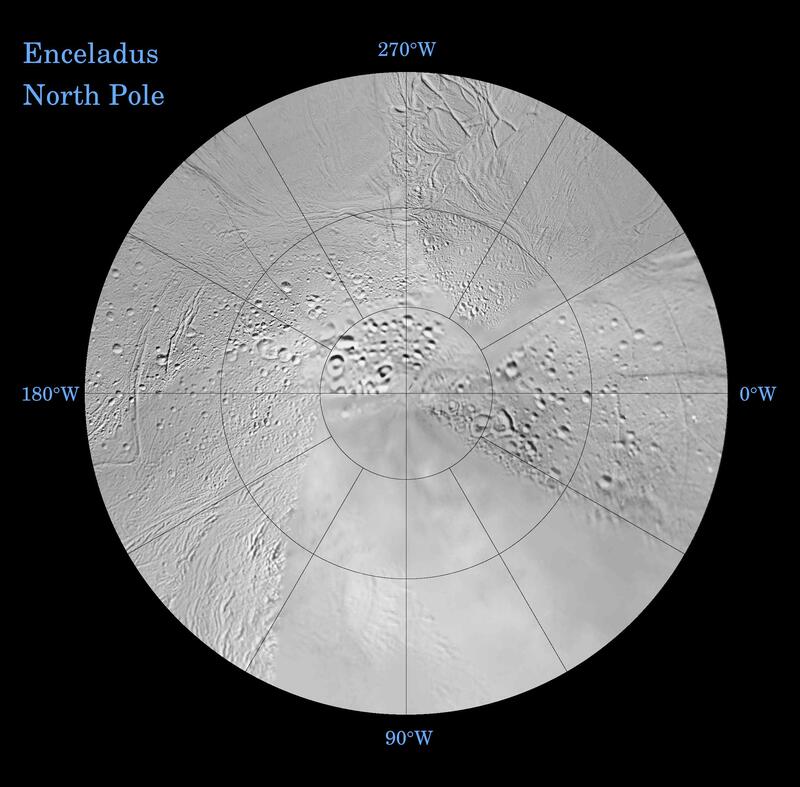 The northern hemisphere of Enceladus is seen in this polar stereographic map, mosaicked from the best-available Cassini and Voyager clear-filter images. The map is centered on the north pole and surface coverage extends to the equator. Gridlines show latitude and longitude in 30-degree increments. This map is being released along with a southern polar projection map (See PIA07720 ). These two maps show that the character of terrains near the north pole (shown here) differs strongly from those near the south pole. Terrain near the north pole is among the most heavily cratered and oldest on the surface of Enceladus. The northern hemisphere map shows that a broad band of cratered terrain extends from the equator on the Saturn-facing side (centered on 0-degrees longitude), over the pole and to the equator on the anti-Saturn side (centered on 180-degrees longitude). Terrains near the equator and mid-latitudes on the leading (90 degrees West) and trailing (270 degrees West) sides of Enceladus are much less heavily cratered and are characterized by intense zones of fracturing and faulting. As seen in the southern hemisphere map ( PIA07720 ), the band of cratered terrain at 0 and 180 degrees longitude extends southward from the equator. However, poleward of about 55 degrees south latitude, the cratered terrain is interrupted and replaced by a conspicuously fractured terrain around the pole that is nearly devoid of impact craters. In contrast to the very old north polar terrain, the southern polar terrain is among the youngest on the surface of Enceladus.